“Get happy. Happy. Happy,” cheer the three members of Bullets & Belles in unison—each time louder than the last, and with arm pumps and laughs. It’s a rallying cry that vocalist Noel Sandberg brought to the neo-doo-wop-folk band when she joined more than a year ago. The local trio uses it before gigs, when times get testy between these best of friends or to bring them together—like pre-interview. Perhaps “Be glad,” rather than “Get happy,” would be a more timely cheer; it’s the name of Bullets & Belles’ catchy, yet deeply poetic debut album. “It builds, there’s a low point, then a revelation and ends on a high point—a message of positivity,” says vocalist and songwriter Erin Haley. And that song’s tension/release is mirrored in the album as a whole. “A lot of [our songs] are about a process of change—dealing with the past, taking on the present, accepting who you are and accepting who you love and who you don’t love,” Haley says. The 11 songs are wrapped in a ’60s soul vibe Ã la Motown and Stax, like the band’s March 2012 EP release, Curried Rice. The arrangements employ that style’s devices on top of a folksy base to create a distinct sonic sensibility; there are harmonies, doo-wops, clapping, snapping, guitar stabs, call & response chants, etc. The tightly crafted tunes feature singing that’s as good as it gets. It’s a fun, fresh listen, but Be Glad is evocative because of the sincerity of the songwriting—brutally honest and effectually vulnerable. For examples, listen to album opener “Peleamos Anyway,” the story of Haley moving to Spain to get away from a particularly fraught relationship. The album slides into the indelibly doo-wop, irresistibly groovy “A Change Unlike the Rest,” an ode to new love that’s finally the right one, written for Haley’s husband and bandmate, Cron. The theme of change, or “existential belligerence,” comes up again in the ballad of the disgruntled office worker, “Monday Morning Prayer”—Haley’s most vulnerable song on the record, she says. Haley’s lyrics are overt and poignant. “I don’t sit down and write to shock people. I just don’t put a filter on myself,” she says. While sometimes challenging, her song-poems are complemented by Cron’s writing style. The two have been performing together for six years, mainly in indie-rock band La Farsa. It’s hard not to focus exclusively on the band’s lyrics and their poetic depth and astuteness. It’s what draws me back to Be Glad again and again. And that’s not to discount Sandberg’s vocal virtuosity and the throwback arrangements, which are an engaging canvas for the poems to sprawl upon. The overall aesthetic is something like Billie Holiday meets Mary Oliver, Bing Crosby minus swinging horns and classic pop with flourishes of contemporary songwriting. 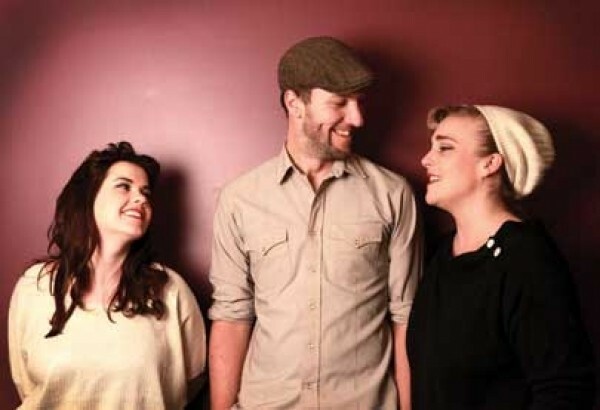 This new genre, neo-doo-wop-folk, is certainly something to “get happy” about. Friday, Jan. 4, 9 p.m.